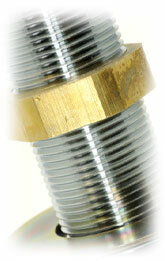 We have the technical expertise to custom design fittings and assemblies for our customers. Our in-house engineering capabilities also allow us to provide an original design when necessary. Additionally, we are capable of manufacturing parts based on any specification provided. We design and fabricate custom hose-fitting assemblies for original equipment manufacturers (OEM's) that require quantities in the single digits to hundreds of thousands of assemblies per order. 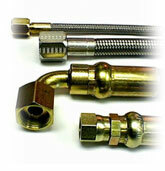 We supply industrial fittings (specializing in stainless steel and brass) to distributors on a wholesale basis. Our products include flexible metal, teflon, rubber, and composite hoses and assemblies. We supply any material fitting, specializing in stainless steel and brass. We provide a full range of fittings for our hoses, including threaded, o-ring, cam and groove, ANSI flange, tube, and sanitary. © Copyright 2007 Global Hoses & Fittings LLC.